Next week, the President of China will make a state visit to Britain. He and Madame Peng will stay at Buckingham Palace in London with the Queen, and a glittering state banquet will be held on Tuesday evening. The last state visit by a Chinese president to Britain happened in 2005 (pictured above). Much of the media speculation about the state banquet has surrounded the possibility that the Duchess of Cambridge will attend. There has been no official announcement either way, although the palace has announced that both William and Kate will take part in other events during the state visit. The only announcements made so far about the state banquet are that the Queen and Prince Philip will attend, and Prince Charles won't -- which means we also surely won't see Camilla either. 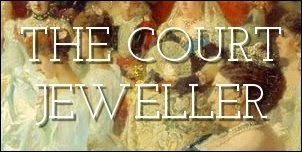 The engagement schedule on the British royal website notes that Princess Anne and the Countess of Wessex both have engagements in other parts of Britain on Tuesday. The Countess of Wessex is scheduled for an evening event in Exeter, but Princess Anne's meeting in Manchester looks to be a daytime affair, so it's possible she may make it back for the banquet. At the last state banquet (when the Mexican president visited Britain in March), the royal ladies in attendance were the Queen, the Duchess of Cornwall, Princess Anne, and the Duchess of Gloucester. Princess Michael of Kent is also sometimes a guest at state banquets. Let's start the tiara and jewel guessing now, shall we? Based on what we know, I think we can assume that the possible guests at the banquet include the Queen, Princess Anne, the Duchess of Cambridge, the Duchess of Gloucester, and Princess Michael of Kent. Here are the tiaras usually worn by each of the likely royal guests. (Of course, we could always see surprises!) Let us know which jewels you hope to see on display in the comments below!